Excelsior Springs City Hall is located at 201 East Broadway, Excelsior Springs, MO 64024; phone: 816-630-0752. 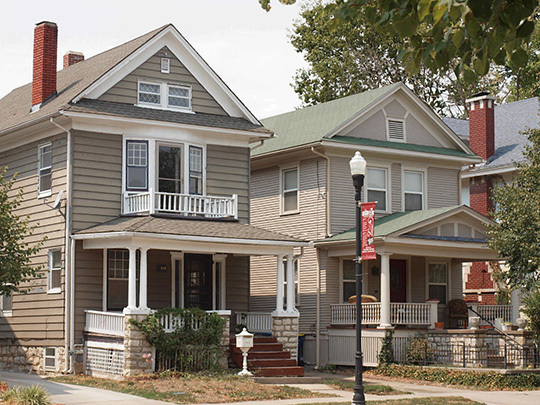 Photo: Homes along Elms Boulevard, The Elms Historic District, Excelsior City, MO. The Historic District was listed on the National Register of Historic Places in 2004. Photographed by Deon Wolfenbarger, 2013, for The Elms Historic District, Clay County, Missouri, nomination document, 2013, NR #04001328, National Park Service, National Register of Historic Places, accessed April, 2015. The city developed after the discovery of the medicinal springs in the Fishing River valley during the 1880s, producing a large core populated by hotels, resort services, bath houses, retailing, and related uses. The attraction of the springs caused residential neighborhoods to grow both in the valley and on the surrounding hillsides. In the early twentieth century, the City Beautiful Movement came to Excelsior Springs. A community partnership retained the great landscape architect George Kessler to develop a parks and urban design plan to complement the springs and knit the city's considerable public and private resources into a unified design plan. In 1912, the city core received direct connections to regional cities with the completion of the Kansas City, Clay County, and St. Joseph Railway electric line, and was also served by the Wabash Railroad. This high-performance interurban operated until 1933, when a combination of highway and steam railroad competition and the Great Depression led to insolvency. To the west, more conventional development patterns followed transportation corridors that followed relatively flat, upland alignments running from northeast to southwest, and including both highway and railroad corridors. In 1924, Highway 10 was completed, linking Excelsior Springs to Kansas City, and by 1930, US Highway 69 was completed to Cameron. Post-war commercial development followed Jesse James Road, while more contemporary civic and commercial growth followed construction of the current 69 Highway corridor. Recent residential development generally occurs west of the current 69 Highway alignment. Finally, residential growth of various periods filled buildable areas between the traditional core and the transportation corridors. The resulting community, influenced by both history and geology and more conventional factors such as transportation and regional growth patterns, dispersed development over a relatively large area. City of Excelsior Springs, RDG Planning & Design and Larkin Group, Excelsior Springs Comprehensive Plan, 2009, www.cityofesmo.com, accessed April, 2015.